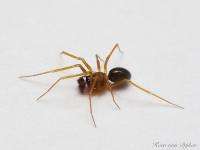 (PhysOrg.com) -- In what at first might seem to be a deficit, being a lousy imitator of another species to avoid being eaten, Czech Republic arachnologist Stano Pekar, shows that the opposite might be true. In a paper he and his team have published on The American Naturalist, he describes how a species of spider that looks sort of like an ant, winds up being less liable to be eaten than are other spiders that are much better imitators. Pekár writes that because some animals, or insects live in environments where there are multiple kinds of predators out to eat them, some, such as certain kinds of spiders, evolve in ways that mimic ants, which many of its predators dont like to eat, but not so much so that animals that do like to eat ants, will eat them. To prove this theory, Pekár and his team collected a bunch of different kinds of ants and spiders and brought them into a lab along with some ant predators. Some of the spiders were good ant imitators, some were poor ant imitators, and some were spiders that fed on other spiders; the other predators in the experiment. After setting up various scenarios to see which spiders were more likely to be eaten by which predators, and watching the results over time, the team was able to very clearly see that the spiders that looked very much like ants were very often eaten by ant predators, but seldom by predator spiders. On the other hand, those spiders that did a poor job of imitating the ants were seldom eaten by anteaters, and because they did look somewhat like ants, they were seldom eaten by the predator spider either, which showed that their shoddy mimicking skills wound up making them more safe in general than perhaps other spiders that did a better job at looking like ants. The study throws mud on most previous theories that suggest animals and insects evolve mimicking skills to protect themselves mainly from one type of predator, and thus, those that do a poor job, are simply confused or are constantly trying to adjust to some new type of predator. Pekár concludes in the paper that species such as the spider studied might have other adaptations in addition to their masquerading skills, such as longer legs to help them run faster, that lesson their deception skills, but increase their chances of survival overall, making them perhaps look silly at times, but once all is said and done, safer than they would be otherwise. It would have to be an itsy bitsy spider to mimic an ant.